The <3 of G scholarship was established at the beginning of this semester in honor of senior Garrett Maliska. During Garrett’s freshman year he was diagnosed with neuroblastoma, which is a cancerous tumor that develops from nerve tissue. Throughout high school, he has battled the disease and has worked to keep up with his classes through the homebound program. “The idea was to pay tribute to the qualities that are at the heart of Garrett Maliska’s character,” academic advisor Justin Estes said. “That he’s able to laugh and smile each day despite all he’s had to deal with says a lot about who he is and what he values.” Many of Garrett’s friends have walked by his side while he battled this disease. “Garrett is the strongest person I know. He wears a smile on his face eveyday despite the pain,” senior Patty Gorzycki said. “He is the perfect person to be honored with a scholarship in their name because, for years to come, he will continue to inspire people to be stronger, tougher and better people.” The Maliska family has been humbled by the generous outpouring from community members for this scholarship. 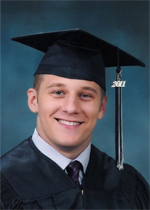 “We were very honored that Garrett was thought of and inspired so many to want to form the scholarship in his name,” Garrett’s mother Leisa Maliska said. Estes utilized social media resources to help spread the word about the scholarship. In the first week alone, the scholarship raised over $2,000. They have currently raised over $8,000 and hope to reach their goal of $10,000 by the end of the school year. “I sent out emails to Bryan ISD and set up a facebook page for the scholarship,” Estes said. “A few business have donated, but the [majority of the money raised] has come from BISD employees and friends of the family.” With such a strong response in the first year, the scholarship looks to have a strong future. “I hope we will be able to continue the scholarship for many years,” Maliska said. “Garrett’s always been one to think of others first, and want to be of service to others.” Estes met Garrett before his junior year and started working with him the summer before his senior year when he came to finish the TAKS tests. “Since Garrett is a homebound student, Mrs. Field and I started going out to visit him and his mother on Wednesdays after work, and that quickly become the highlight of my work week,” Estes said. “Getting to spend time with him is a blessing, and I’ve been fortunate to work with him and his family this year.” This scholarship will help other students achieve their dreams and make the most of life. “Students like Garrett make me think about what it is that I’m doing with each day that I’ve been given since nothing in life is really guaranteed,” Estes said. Students with a GPA of 3.0 and who are strong academically and involved with extracurricular activities or the community can see Ms. Kerr in the Go Center for an application. “We encourage anyone to apply who’s had to overcome obstacles or deal with challenging circumstances in order to achieve success in life,” Estes said.